I've never heard of this gem before, but it sure sounds like the bee's knees! Thank you for your commentary on it, I laughed out loud several times. Ha! This movie really as a "love at first sight" experience for me, Callie. It’s hard to put my finger on precisely what degree of artistic ineptitude in a movie makes it insufferable, and how much turns it into “lightening in a bottle” bliss; but “Hippie” is just my kind of Good/Bad movie. Certainly a movie that takes me back to my Haight/Ashbury childhood, but it’s not a movie I’d recommend to most (which to me is what really defines a cult film. Not this post-Tarentino-era thing of everybody checking in with each other on whether or not its “cool’ to like a certain move). Thank you so much for reading this, and I’m doubly pleased if you got a chuckle or two out of it! Thanks for the fun read. You, sir, are outtasite. I dig you. I daresay Shmuel looks much better as an old man. I immediately thought of a male Rossy de Palma. But I was always as uncomfortable with sixties slang as these actors appear to be. Even at a time when you could say such things aloud without anyone giggling. 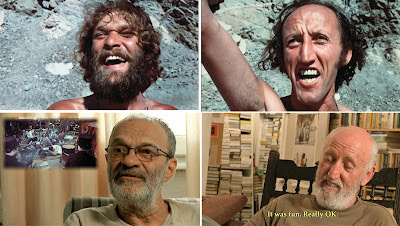 And how cool of you to bring up two points identical to thoughts that crossed my mind when I saw the film--I too thought of Almodovar's Rossy de Palma when I looked at Shmuel, and marveled that indeed old age agrees with him. How remarkable for a man to actually look handsomer in his 80s than in his 30s! well.......handsome is kind of a stretch, let's go with 'robust'. Ha! On the contrary--to live to be 80-plus, have your wits about you, a sense of humor about yourself, and to have left your face and body alone, aging gracefully into what one is (as opposed to what passes for faces in the face-lift addicted USA)--well, that seems like the textbook definition of handsome to me. Ken, I envy this being your milieu, with your San Francisco roots, growing up with flowers in your hair and all that...so romantic! 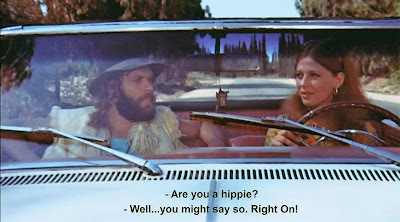 Must see this film, as I too am a hippie at heart! Ha! I do wonder how my parents took the whole hippie thing. 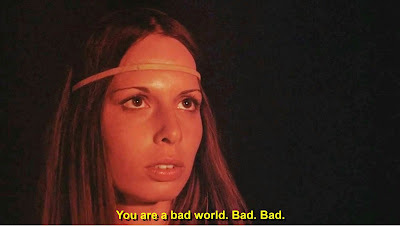 i think I lucked out in that I was just young enough to be dazzled by all the superficial surface style (flowers, love beads, peace symbols, decals), but I don't have a strong memory of how adults responded to hippies lying all over the city with their incense and rainbow candles. A movie like this reminds me that there was a great deal of idealism behind all the "stuff," and that in its earnestness, it was perhaps a little comical and corny. I'm sure I idealize a lot of it, but if I had to be a kid in San Francisco, I guess I couldn't have picked a more exciting time. Thanks, Chris! hope you check the film out sometime...but consider yourself warned! Thanks for posting this and for inspiring me to move it to the top of my To Be Watched pile. I have a fondness for movies like this where the director is passionate about something and wants to make a movie realizing his vision but just doesn’t have the skills, or even a clear understanding of his own concept, to bring it off. Having worked on a number of creative endeavors over the years (plays, bands, writing) I know how hard it is to bring any artistic project to life. Where someone gets the drive required to get a movie like this made is a mystery to me. It’s easy to snark about a project like An American Hippie in Israel, and I would have been the first in line with the jabs in my younger days, but now I have nothing but respect for anyone who can pull off something like this. One interesting aspect of a movie like this is that even when the final result is not what the director intended, the effect can be mesmerizing. On the one hand you get ham-fisted images like the steamroller crushing flowers, a particularly on-the-nose metaphor for the modern world crushing the Flower People. And then you get things like the dream sequences, the two Ghosty Men and the sharks that feel genuinely surrealistic because the director has so little control of his vision that his subconscious is making its way directly onto film with no mediation. And the scenes on the island, with the spooky blend of desert desolation in the middle of a lake, are eerie and otherworldly. The ending is genuinely chilling and for me the lack of set up made it even more horrifying. 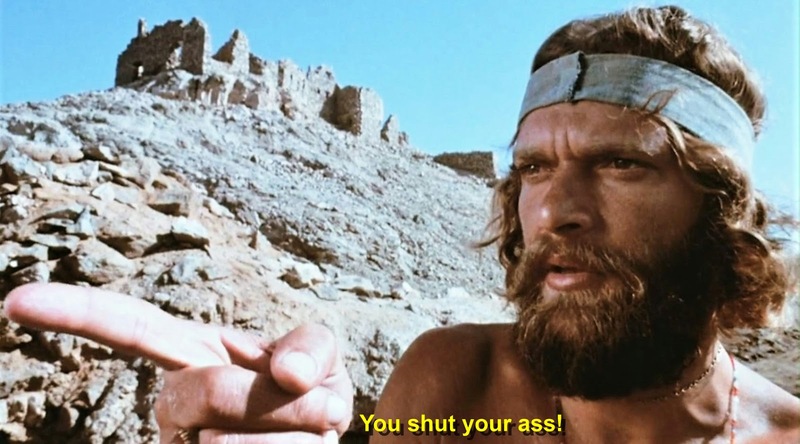 That being said, much of this movie is risible and it is very hard not to hoot at a lot of the scenes. The color coded bathing suits, the hippie dancing and the dialogue are all too easy to mock. And there are more than a few tedious spots, mostly involving driving and nattering on about freedom. And I’m with you on the interviews. Asher Tzarfati comes off as a bit skeevy but Shmuel Wolf is charming. He really grew into his face and losing his hair was a good thing for him, appearance-wise. I love how he explained that he had long hair because it was the style at the time but that he wasn’t a hippie. 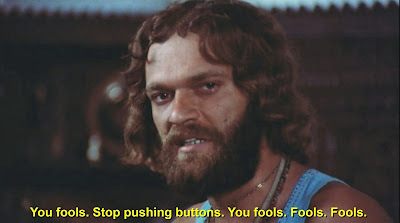 And then he got wistful, and a little bit shy, at the memories of playing a hippie for a few weeks. This is a movie that I will watch again but I’m not sure that I know a single person I can recommend it to. It’s an odd one, that’s for sure. 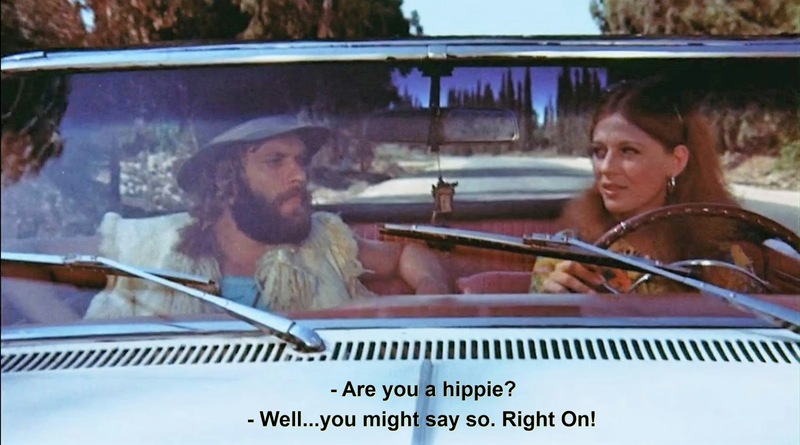 Thanks for contributing another perspective from having had the "Hippie in Israel" experience. I particularly like you appreciation for the director's obvious enthusiasm and belief in what he was doing, and the way his sincerity mitigate the his not-always-successful results. From the days of Ed Wood, many a low budget feature I think would benefit from a little less "auteurism" and a bit more delegation of duties. I worked on a musical many years ago where the director wrote the book, the songs,and the lyrics. He was just too close to it all, only had himself to answer to, and the show suffered from not having someone able to tell him that he was losing his way and straying from his theme. In regard to this film, I agree with you in that Sefer's vision my be unchannelled and unfocused, but his obvious belief in what he thinks he's trying to say puts a lot of interesting things on the screen he was probably not at all aware of (I'm just glad they abandoned that original ending). 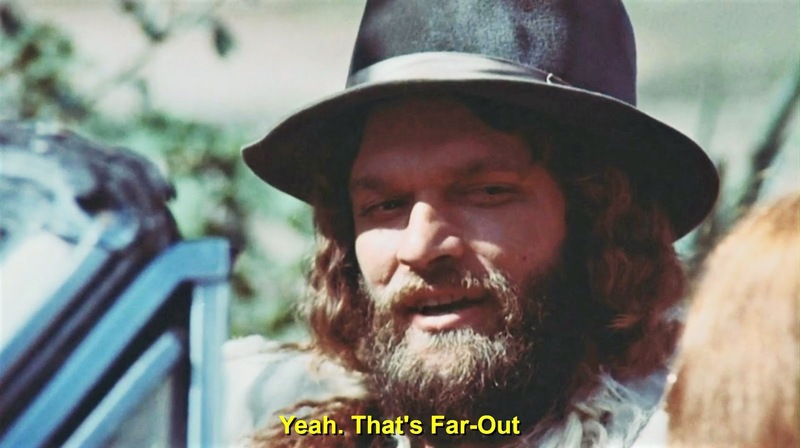 With all you relate about your own experience watching the film, I suspect that had "American Hippie" been released in '67 or '68 (when none of the dancing, idioms, or attitudes would have been so amusing), even with it's faults, I think it would have had a better reception. By 1972 hippies were appearing on The Partridge Family and the Mansons had really knocked the boom off the daisy. Your non-cynical attitude to the film is very refreshing and very much in tune with what lingering affection people have for movie like this. You can laugh at the dated trappings and technical shortcomings, but if you're creative at all you always have to respect that sincerity will always be the riskier venture, artistically speaking. And when someone (even someone marginally talented) believes in themselves and what they are doing and are not trying to pull the wool over our eyes...trying to say and do something they think is relevant. Well, you're right, you have to respect that. Even as you laugh. Such a pleasure to read your thoughtful take on the film and the sensitive perspective you chose to take. Very refreshing, and perhaps enough to convince a few more readers to give this film a try. We both are in the same boat in recognizing it to be a difficult film to out and out recommend to people. Thanks, Michael! I'm pretty certain that I enjoyed your delightful writeup more than I would the movie. Definitely it's bringing back memories of Head, and, The President's Analyst. Thanks for reading this, Allen. 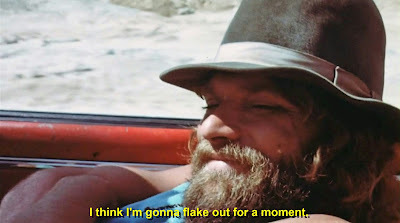 As much as I like it I'm also fairly certain the adventures of Hippie Mike are not exactly your bag, man. I've never seen The President's Analyst, but HEAD was a curio that went straight over mine. Reminds me of another forgotten rock group psychedelic film from 1970 called "The Phynx" a real oddity, that one. The Phynx. 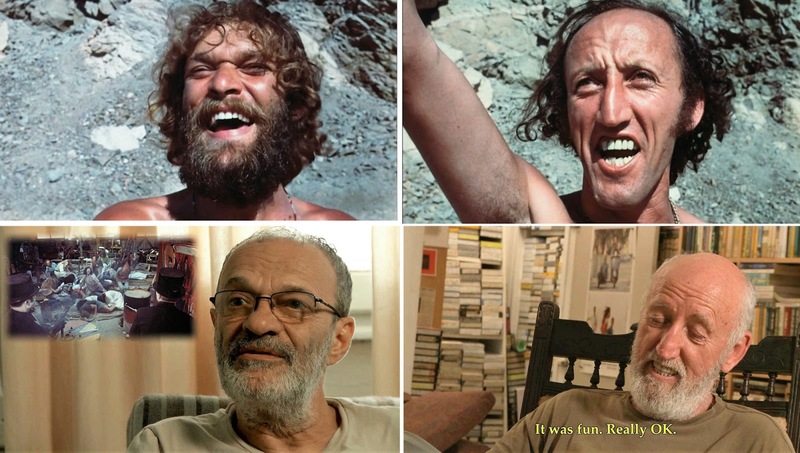 Now there's an insane movie. I can't tell who the satire is aimed at. Is it Old Hollywood, New Hollywood, pop music, Albania or what? It's a mess and it should be more entertaining, even on a train wreck level, than it is. Definitely worth at least one viewing because it may the ultimate What Were They Thinking? flick. I'm not sure if it's worth it, but I'd love to read one of your reveiws on it. You nailed it- "The Phyynx" is so unfocused in its satire it makes "Myra Breckinridge" look like "Dr. Strangelove." I watched it primarily for the lineup of Old Hollywood guest appearances, but left feeling it fell somewhere between that Sonny & Cher film "Good Times" and a very weak episode of "The Monkees."